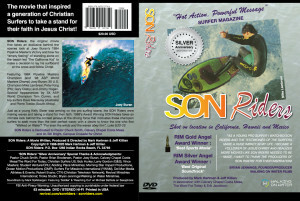 SON Riders; the original movie that takes an exclusive behind the scenes look at Joey Buran’s 1984 Pipeline Master’s Victory and how his “empty feeling” of standing alone on the beach at Pipeline after the contest, lead ‘The California Kid’ to make a decision to lay his surfboard and contest trophies at the cross and follow Christ. 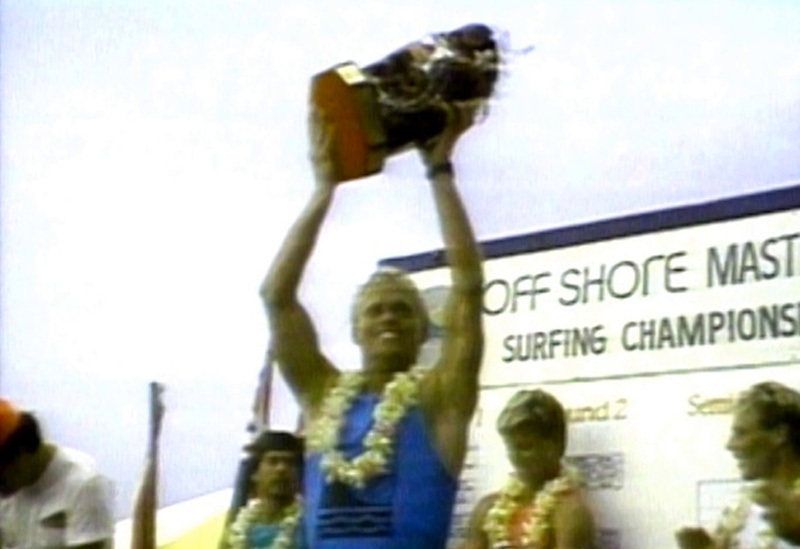 Featuring 1984 Pipeline Masters Champion (and ’98 ASP World Masters Champ) Joey Buran; 3X U.S. Champion, Mike Lambresi; Peter King (PK); Gary Clisby; and Jimmy Hogan. With Special Appearances by 3X ASP World Champion Tom Curren, and top surfers Dave Macaulay (Australia) and Pierre Tostee (South Africa). Technical Note: Most of the footage in SON Riders was shot in (higher resolution) Beta Cam format, however some of the 3/4″ footage in SON Riders does not appear as “Sharp” as the Beta Cam footage (Joey Buran at Oceanside & Rocky Point), compared with today’s HD standards. We were the first to break ground by shooting a feature length surf movie entirely on professional grade video (no film). It was state of the art in the late 1980′s… Even in the trailer, you can see the difference from the Beta Cam and the 3/4″ footage. SON Riders was featured on ESPN’s popular ‘Surfer Magazine’ program in 1989 for featuring some of the most “High Profile” surfers of the day, taking a public stand for their Christian faith and also for breaking ground in this “new technical frontier” (video vs film). SON Riders was also the first “Surf Film” to utilize large screen video projection for it’s “Theatrical Tour”, as opposed to the standard 16mm Projection that was common for the day, in the late 1980′s. ‘SON Riders’ – The movie that inspired a generation of Christian Surfers to take a stand for their faith in Jesus Christ! Just as a young Kelly Slater was arriving on the pro surfing scene, the SON Riders were making waves and taking a stand for their faith, while competing on the World Pro Tour. 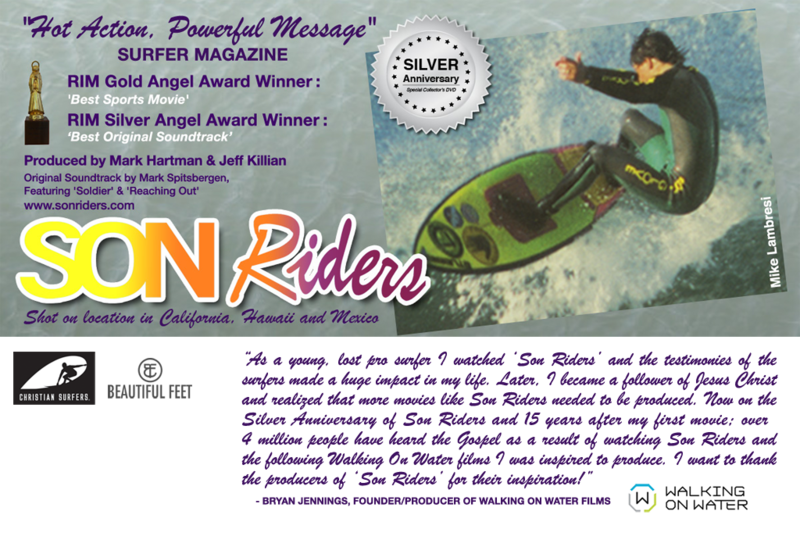 1989’s Gold Angel Award Winning SON Riders takes an intimate look behind the contest jerseys at the driving force that motivates these champion surfers to seek more than the next perfect wave; with a desire to know the one who first “Walked on Water”! “For even the winds and the waves obey Him”, Luke 8:22-25. Special Thanks to: Pastor Chuck Smith (Calvary Chapel); Bob Hurley; Larry Gordon (G&S); Pastor Rick Yeomans; Dr. Bill Bright (CRU); Chuck Klein (CRU/SV), Josh McDowell, Tom Hacket (YWAM/SFMI), Mark Curtis (CSA), Bob Cording (Omega Films) & Jerry Dow (Founder – Christian Surfers). Original Soundtrack by Mark Spitsbergen; featuring the Hit Title Track, ‘Soldier’ & ‘He’s Reaching Out’. I started the pre-production of ‘Son Riders’ developing the concept, treatment and script while working with Bob Cording and Omega Films as his Director of International Film Distribution in the mid 1980s. A series of interviews I conducted with prominent (outspoken) Christian Surfers, Joey Buran, Mike Lambresi (and others) for San Diego’s ‘Good News etc.’ Christian Newspaper formed the nexus and helped give birth to the original idea. Bob Cording, along with Jerry Humphries (Cording/Humphries Films) produced the classic surf films; ‘Tales from The Tube‘ and ‘Son Seekers’ in the 1970’s (among other notable Christian Sports Documentaries like ‘Football Fever’ & ‘Football Fever Strikes Again’ in the early 1980’s). ‘Tales from the Tube’ featured the iconic Surf Movie Poster from the late surf artist Rick Griffin and some of the first ever (pre-GoPro era) helmet cam footage “from the barrel”. If you “Google” ‘Rick Griffin, Tales from the Tube Movie Poster’, many will recognize his famous artwork for the classic surf movie poster. Bob Cording also produced a number of films with Calvary Chapel Costa Mesa and Campus Crusade for Christ, including ‘Son Worshipers’, documenting the Jesus People movement that led to the birth of Calvary Chapel (in the late 1960’s/early ’70’s), under the leadership of the late Chuck Smith. At the time I started work on ‘Son Riders’ , Bob was moving his Christian Film Ministry into the genre of dramatic motion pictures (away from Sports Documentaries) and encouraged me to pursue my vision for ‘Son Riders’ as a solo (or “Indie”) project which I did, along with help from a few “friends” and a collaboration of ministries and surf companies like G&S and Billabong (under Bob Hurley). In so doing, Bob Cording inadvertently passed the ‘Christian Surf Film’ torch to us (Jeff & I), while in the same manner, we would “inadvertently” pass the torch of inspiration to Bryan Jennings of Walking on Water, by his exposure to SON Riders some years later. It is cool to see how God works to spread the fire of inspiration and connect the dots, or “million points of light”, as some have said. Some time shortly after having a number of conversations about this fledgling project with Omega’s Producer, Bob Cording; soon to become ‘Joint Producer/Production Partner’ Jeff Killian came into our Omega Films Office in Rancho Santa Fe, CA and enquired about “possible” future positions for Videographer/Editor. Bob was a dedicated ‘Film’ Producer (film cuts meaning celluloid on the Editor’s floor) and had not yet embraced the world of video technology. I however, saw things differently. Jeff, a brilliant cameraman, editor and savvy producer in his own right, was the perfect addition to round out the core SON Riders production team. He embraced the SON Riders vision and we planned our first shoot back in 1986 (at the ASP Stubbies Pro, Oceanside, CA). The rest, as they say, is history. “We are extremely excited to be included in the re-release of such an epic film. We are definitely an advocate for SON Riders”. The Christian Television Network has launched a new channel called LIFESTYLE – CTN Family Television! This network is a safe environment for viewers where they can watch news, sports, live call-in programs, health, nutrition, dramas and movies all in one place without worrying about the offensive promos or un-Biblical subject matter that you experience from most networks. The programming lineup for Lifestyle is diverse and unique and offers viewers wonderful insight through life changing testimonies like those featured in the Son Riders surfing movie. The average American watches 4 hours of television per day. Our hope is that networks like Lifestyle can make that viewing time encouraging, uplifting and edifying. LIFESTYLE – CTN Family Television is a watchman, guarding the eyes and ears of viewers and encouraging entire families to live a complete Christian LIFESTYLE.